Get out of town with these interesting Saariselka side-trips: Inari (Tuula's Reindeer, Siida, & more) and Taatsin seita (in Kittila). 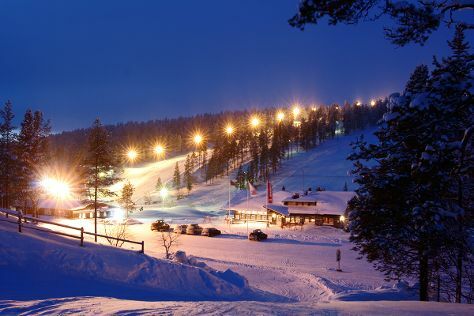 On the 2nd (Wed), spend an exhilarating day on the slopes at Saariselka Ski & Sport Resort. To find traveler tips, where to stay, and tourist information, read our Saariselka trip planner . In January, plan for daily highs up to -11°C, and evening lows to -20°C. Finish your sightseeing early on the 7th (Mon) to allow enough time to travel back home. Start off your visit on the 8th (Tue): don't miss a visit to Marttiinin Wanha Tehdas, then look for all kinds of wild species at Wildlife Areas, then see Santa Claus Office, and finally get in on the family fun at Santa Claus Village. Keep things going the next day: explore and take pictures at Lappi Areena and then take an in-depth tour of Arktikum. To find more things to do, other places to visit, ratings, and other tourist information, go to the Rovaniemi trip planner . You can drive from Saariselka to Rovaniemi in 3.5 hours. Alternatively, you can take a bus. In January in Rovaniemi, expect temperatures between -10°C during the day and -17°C at night. Finish your sightseeing early on the 9th (Wed) to allow enough time to travel back home.